An onsen, or a hot spring, can be a classic Japanese experience in winter. We enjoy soaking in nice hot water packed with various minerals as an ultimate leisure activity as well as a medical treatment. You might be hesitant with an idea of being naked or soaking in hotter than Jacuzzi water to relax. Onsen resorts in Japan often offer various types of baths (foot bath, outside bath, private baths), entertainment facilities and restaurants. I am sure you would find something you can enjoy and experience onsen culture. Here are 7 onsens you can make a day trip in Kyoto. I will introduce onsens in the city and suburb of Kyoto ♨. 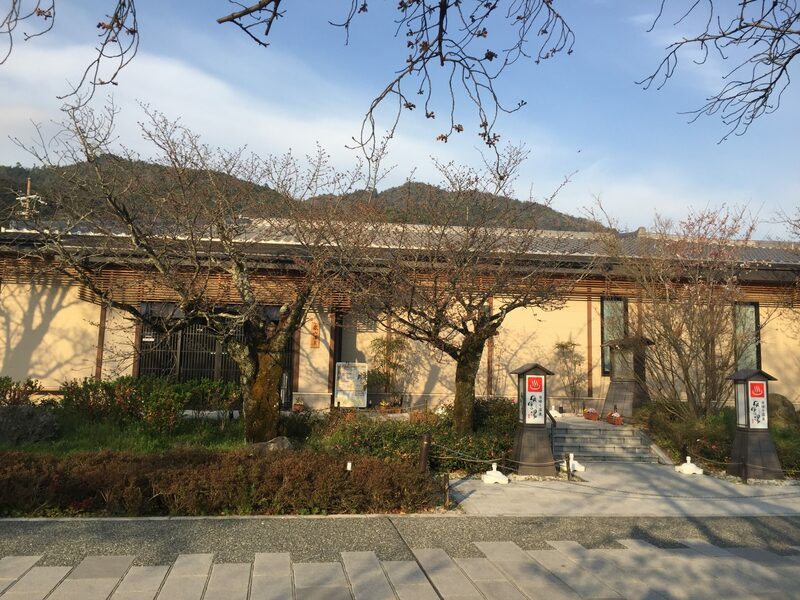 I would like to introduce 6 onsens in Kyoto city first! Tenzan no Yu is located in Saga, Arashiyama area. It is a spa-resort like facility where you can spend a whole day. The natural hot spring water comes from 1,200 meters underground. It is the first sodium and calcium chloride spring in the Kyoto Basin. The water here is known to be great for your skin. The facility holds a variety of baths: a foot-baths, a carbonated spring bath, and a fish spa. They are luxurious,modern yet classical. I highly recommended you to try onsen here if you visit arashiyama area! Hana no yu is located 5 minutes walk from JR Tanbaguchi station. They offer 12 kind of onsen including roten buro,jacuzzi bath,and relaxation bath,and 2 kinds of sauna. I especially recommend you to try Jacuzzi bath. The bubbling of the Jacuzzi will help you to relax and recover from fatigue. The natural hot spring water comes from 1,300 meters underground. It’s high quality water makes your skin smooth and healthy. If you want to enjoy onsen with locals, you should visit Hana no yu! Nizaemon no yu is located in Katsura in Kyoto. They have 2 kinds of hot springs, directly from the source.One is hot water, and the other is cold water. The smooth water is chloride hydrogen carbonate content water with clear and scentless. It makes your skin silky smooth after you bath. I cannot bath in a cold water, but some people enjoy taking a bath with hot water and cold water alternately. It is said taking a bath in that way will help you to recover from fatigue. Experience mineral-rich hot&cold waters at Nizaemon no yu! Tensho no Yu is a pubic bath offering natural hot spring water originating from 1,000 meters underground. There are open-air baths and a sauna as well. There is also a unique bath called “Hydrogen bath” which makes your skin beautiful by the power of hydrogen. In order to get to Tensho No Yu, you take the City Bus #33 to Omiya Daimon Cho. Or you may take a train (Hankyu Kyoto Line) to Nishikyougoku or Nishioji Station on JR line, with a 10 minutes’ walk. Fufunoyu is located near Togetsu bridge in Arashiyama. Arashiyama is famous for it’s onsen facilities, but there are only a few facilities which offer day use onsen. Fufu no yu opened in 2014,so the facility is very clean and modern. They offer four types of onsen:uchi buro(Inside bath),Silky buro,roten buro(an open air bath) and Utase yu(stream of water cascading onto yourback),and two kinds of sauna. The onsen is effective for skin care, muscle pain and neuralgia. Why don’t you soak in the bath at fufu no yu after walking around the bamboo forest and tenryuji temple? It’s very relaxing after a long day of walk! Kyoto Tower Public Bathhouse ~YUU~ is conveniently located in the basement of Kyoto Tower near Kyoto station. It’s just an ordinary sento(public bath), not an onsen (hot natural spring). YUU opens from 7 a.m. in the morning, which is perfect for those that want to have an early morning dip. It’s not worth visiting if you stay far from Kyoto station but it would be useful for those who stays near Kyoto station. Next,let’s go to onsens in the suburb of Kyoto! Kurama Onsen is in the quaint mountain, located only one hour away from the middle of Kyoto. It offers both inside and outside hot spring baths. You can enjoy the natural sulfur hot spring while filling your lung with the clear fresh air. The fee for day visitors is 2,500 yen (1,600 yen for children). This includes the use of the open-air, inside bath, and the lounge area, as well as rental of a yukata (cotton robe) and a bath towel. Despite its name, Funaoka Onsen is actually a sento (public bath), not an onsen (hot natural spring). The building dating back to 1923, it is the oldest sento in Kyoto. The building tells its story: it is classic all the way from the charming exterior to the ranma (beautifully carved wooden panels) that divides the male and the female section. Ohara Sanso is a simple inn, making its hot spring available for day users. They offer 3 kinds of onsen:Uchi buro(Inside bath),Han roten buro(Semi open-air bath),and Goemon buro(A bath heated directly from beneath). Surrounded by the tranquil mountain, this is a great location for you to get away from the urban noises. Cycling around Ohara and taking a dip in onsen might be a perfect spa plan for you. Its soft alkaline water is great for your skin. Various set plans (combining a hot spring entrance with a meal/activity) are available for you to choose from. You cannot use only onsen, you need to order meals, but prices are reasonable starting from 1,000 yen. If you want to enjoy onsen while surrounded by rich natural scenery,you should visit Ohara no sato! Location:From Kyoto station,take Kyoto bus #17 or #18 bound for “Ohara/大原” and get off the bus at last bus stop and walk for 13 minutes. Ikkyu’s spring water is milky and silky, so soft to your skin. Ikkyu is a big spa complex offering indoor, outdoor, and carbonated baths, a stone sauna, massage spa, head spa, and a restaurant. The entrance is 1,143 yen for the facility, 762 yen for 90 minutes of a stone sauna. To get there, you take Kintetsu Kyoto Line to Shintanabe Station, then get on the Keihan Uji Bus #60 or #62 and get off at Ikkyu Onsen Mae bus stop. Tenzan no Yu・・・It is a spa-resort like facility where you can spend a whole day. Hana no yu・・・They offer 12 kind of onsen including roten buro,Jacuzzi bath,and relaxation bath,and 2 kinds of sauna. Nizaemon no yu・・・They have 2 kinds of hot springs, directly from the source.One is hot water, and the other is cold water. Tensho no Yu・・・Tensho no Yu is a pubic bath offering natural hot spring water originating from 1,000 meters underground. Fufu no yu・・・Fufu no yu opened in Arashiyama in 2014,so the facility is very clean and modern. Kurama Onsen・・・You can enjoy the natural sulfur hot spring while filling your lung with the clear fresh air. Funaoka Onsen・・・The building dating back to 1923, it is the oldest sento in Kyoto. Ohara no sato・・・Ohara no sato is a simple inn, making its hot spring available for day users. Kamigata Onsen IKKYU Kyoto Honkan・・・Ikkyu is a big spa complex offering indoor, outdoor, and carbonated baths, a stone sauna, massage spa, head spa, and a restaurant. I hope you’ll enjoy the pleasure of Onsen bathing in Kyoto! What would you say is the top 5 best onsens in Japan? I don’t know Top 5,but Top 3 would be Arima Onsen,Kusatsu Onsen and Gero Onsen. Sorry, I cannot change the capture in English.